Highlights Beer, Craft Brewers and Brewing Establishments in the United States. In response to spectacular growth in the craft brewing industry – sales of craft beer grew 11% by volume in the first half of 2007 – Anheuser-Busch is poised to release Budweiser American Ale in September, 2008. Annie Chavez of Aurora Productions, with her engaging smile and warm, welcoming manner,was committed to exposing me to the wonders of Anchorage. As a first stop, Humpy’s Great Alaskan Alehouse, named after the Humpback Salmon, was awaiting this weary traveler. You think about how this is “for the birds,” this getting-up-early-thing, but you quickly re-focus on what is important. You are on a mission. This is Bethlehem Brew Works Brewery & Restaurant, a magical place that effervesces with energy and draws beer lovers into its welcoming refuge. Bruce Nichols, the Great Gatekeeper of Philadelphia Beer, passed away on November 30, 2010, after a brief battle with Leukemia. What is American Craft Beer? The Brewers Association clears up any questions you might have. In addition, provides a list of Beer Industry Definitions! Why craft beer? What exactly is it, and why should you care? How is it different from mass-produced beer? San Diego, with its mild climate and relaxed attitude was new to me. The delicate fragrance of roses, growing in abundance around the Town & Country Resort, took a back seat to the mild aroma of fresh beer. Spanning both sides of the hallway, the mural, executed in the Raoul Duke-style of Ralph Steadman, tells the Flying Dog story, peppered with as much color as the legendary tales of George Stranahan and Hunter Thompson. Wondering who is the best in beer? Dicover the best of the best in the Great American Beer Festival 2005 Winners List. This is a PDF File. Enduring stories, legendary heroes and fascinating events are immortalized in award-winning beers of high quality, seductive aromas and superior taste. Traveling along Kenai Peninsula, you are beckoned southward to the very tip – the Banana Belt of Alaska, Homer and Homer Spit, the “Cosmic Hamlet by the Sea.” A boy from Texas could fall in love with a place like this. The woman of the new millennium simply does not scare that easily, whether she is dressed in her classic rose-petal gown with vintage opera gloves or bedecked in the hat of an entrepreneurial adventuress. Online Blood Alcohol Content Calculator - for rough guesstimates only, but is a great reminder to drink responsibly. The difference between try and triumph is the UMPH! and for Triumph Brewing Company the UMPH has taken on a sadder tone this week with the passing of Jay Misson, 45, Director of Brewing Operations for three Triumph brewpubs. When Leslie and Mark Henderson chose to open a brewery in 2003, they fittingly chose the Magnolia as the symbol of their tenacity. Up to that point, not one brewery had been established in Mississippi since Prohibition. When I was contacted by Michelob, one of the regional brands in the Anheuser-Busch Inbev group, I looked with doubt at the possibility that a Michelob product could stand up to the artful brews created in a small local shop. She had pink hair, vibrant, pink hair…and her smile had the candlepower to light the whole of New York City. 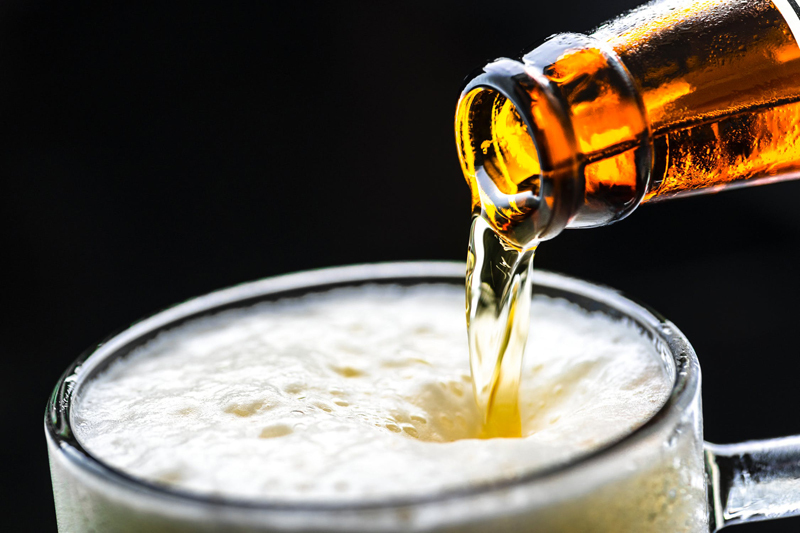 The Silly Beer Laws by U.S. State illustrate some very bizarre legislative action - from Fairbanks, Alaska, where it is illegal to serve alcoholic beverages to a moose - to Woburn, Massachusetts, where it is illegal to walk around with a beer in your hand. The Silly Beer Laws by U.S. State are merely a broad illustration of the range of regulations covered, from the ridiculous, "In Nebraska it is illegal for a bar to sell beer unless it is simultaneously brewing a kettle of soup," to the mundane. Beer Hunter Michael Jackson often spoke to me about Steve Hindy, one of the co-founders of Brooklyn Brewery in New York. From my own journalistic perspective, Steve had a scintillating past. With twenty-four beers on tap and a stunning offering of bottled selections, The Blind Tiger Ale House built a reputation of distinction that drew plaudits and patrons from all corners of the city and state, as well as from neighboring states and locations across the globe. In a world where franchises and big business do their best to capture market share, the craft brewer seems to be a dying breed. When big business wields the sword, few have the resources to fight it. Believe it! The combined power of the Internet, digital TV and radio, and traditional print media has the ability to provide enough high-voltage for a small-town business to subdue even a billion-dollar corporate giant. Dedicated to passionate beer drinkers in the United States. At Victory Brewing, it is all about the love of beer - the imaginative creation of an ideal, ten years in the making. Ten Years Alt, an iridescent, traditional, chestnut-copper beer, brewed to commemorate the tenth anniversary of Victory Brewing, seizes center stage as the first Doppelsticke Alt to be brewed in the United States. Vidalia MarketPlace in Lansdale, PA, USA sells the amber liquid in a way that respects beer as the reverent life-form it is. At the same time, it strongly appeals to the emotional shopping styles of both women and men. What is an American Craft Brewer ? Beer is a sensual experience. Few can deny the initial salivation that occurs as one observes her favorite beer, spilling into the glass. It is Ravel's Bolero; Saint-Saens's Havanaise; Milt Jackson's Stairway to the Stars. Awesome online presence for the Oldest Brewery in America. Read about beer and brewery history, Fine Yuengling Beers, tours, downloads, more!